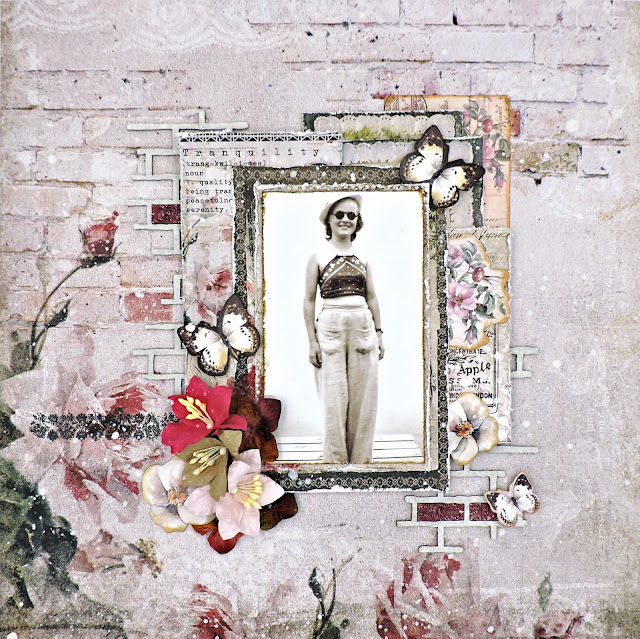 This is my first project using the August kit and add-on from Swirlydoos, featuring papers, embellishments and embossing powders from Blue Fern Studios, along with a lot of other goodies - some elegant and some just plain fun. Lots of layering here, using the Hushed paper from the BFS Tranquility collection as a base and Calling Cards from the same collection to mat my photo. I used a bit of a rub-on from Kaisercraft to create a small band on the left of my photo before placing my treated chipboard pieces where I wanted them. Next, I distressed and arranged the pieces of paper, stapled them together and adhered them to the base. My photo was glued to a bit of cardboard packaging to give it a bit of a pop, then fastened down. The flowers are all part of the Flower add-on - Petaloo velvet hydrangeas from the Chantilly collection and BFS flowers from the Tranquil Roses and Lilies package and the Special Swirlydoos Collection (yes, these were assembled especially for the Swirly Girls!). The rest of the embellishments are part of the Magnolia Lane Ephemera Die-Cuts from Ultimate Crafts. I finished my page by sprinkling some Prima Micro Beads between the flowers and my photo and splashing a small bit of watered-down gesso over the page. This is my mother around 1940. And of course, there's a bit of a story to tell about it. Take a good look: she's wearing a halter top and (seemingly) no bra. My sisters and I had a good giggle about this - there is no way on the face of this earth that she would have allowed any of us to leave the house dressed like this!! !